The Happy Lands was co-created by Theatre Workshop Scotland and more than 1,000 Fife residents. 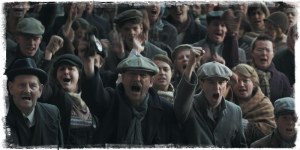 Based largely on first-hand accounts from miners, it dramatises three families’ experiences of the 1926 lockout and general strike. Volunteers spent 88,000 hours on research, screenwriting, costume making and set building, becoming involved in all aspects of production. None of the cast had previous acting experience. George (Joki) and Margaret (Megs) Wallace are a real-life couple who play on-screen couple Dan and Ruby Guthrie. Joki worked as a coal miner for 30 years before being sacked in the 1984–85 strike; both he and Megs come from a long line of miners. Joki’s performance in The Happy Lands earned a BAFTA nomination for best actor. Robert Rae, artistic director of Theatre Workshop Scotland, began his film career with Trouble Sleeping, the BAFTA-winning story of an Edinburgh refugee community. Robert Rae Tell us how and why you got involved in The Happy Lands and ended up committing almost three years of your lives to the project. Joki Wallace I worked myself for 30 years down the pits along with my dad. My grandads all worked in the pits. So I went along to the community centre and got involved. Megs Wallace We wanted to do something together. I come from a mining background as well – my dad died from working down the pits. [Making the film] brought back memories of the ’84–85 struggle. I didn’t know much about the 1926 strike, but it did bring back the memories of how close everybody used to be. Robert How did your dad die? Megs Pneumoconiosis. He was ill for a long time and died when I was nine. Robert Did it take people long to recover from the ’84 strike? Joki We got £13 a week plus milk tokens. When I went back I wasn’t only on strike for a year – I was sacked and I was out for another eight month after that. I had taken a mortgage out just before the strike. The main reason [we held onto the house was the woman] in the building society – her man was on strike! I went to see her and she says, ‘I ken where you’re coming fae. Pay what you can and we’ll sort it out after.’ They thought the strike was going to last a couple of days. I had a full year’s mortgage to pay [when] I went back in November. Robert Part of the reason for looking at 1926 rather than ’84–85 was that people felt that strike was still too recent – that there was still too much bitterness around what had happened, and the community needed an opportunity to come together. The other reason was the many parallels between 1926 and today: austerity measures, the government and employers demanding people work longer hours for less pay – all done in the ‘national interest’ to deal with the debt. Joki It’s everybody else’s fault bar them. It’s no the bankers’ fault, it’s our fault, it’s the immigrants’ fault – you name it. They blame everybody bar the real reason: people speculating with money. Greed. That’s what the film brought out about 1926. The millionaires are still partying and people are still struggling to pay their rent, keep their houses. Robert Is there nostalgia for the social fabric of the mining villages, and what’s different about the communities around Fife today? Joki Aye, there’s definitely nostalgia. The biggest difference today is that people don’t stay in the same place anymore. They come in and they move on, whereas when I was young most people in the villages stayed all their lives. Megs That’s because they were more or less in their jobs for all their lives. Joki This street here was built for miners coming through fae the west of Scotland. When I moved in 30 year ago, this whole cul-de-sac was filled with miners, and now there’s only me and Jim up the road who worked in the pits. People come for a year or 18 month and move on. Robert Do you think that’s why it’s proving hard to build the kind of popular resistance to the austerity measures that we see in the film? Megs It’s opportunity. During the film we became a community – all the folk that were in it – and we still meet up and we’ll always have this shared experience. When something comes up, you pull together. If anything happened – let’s say it was something to do with our street – them that’ve been through that know how to rally folk together and make a stand. And that’s teaching other ones who’ve never been through it. It’s how you stand up against them that’s against you. Joki I think the one thing the miners have got that the other union don’t have – the miners are not afraid to fight. I don’t mean just collectively fighting. They’re not afeared to stand toe to toe with the polis. I was in jail more than I was here during the strike. I got lifted in Lochgelly – me and half a dozen others – and I gave as good as I got. I work with people now who are trade unionists who wouldn’t dream of doing that. I think that’s where the difference comes – when you come fae a mining village, you stood shoulder to shoulder and toe to toe. I’m working at a college. It was a different situation when I was at the pit. The pit was a closed shop anyway; you never got into the pit if you weren’t in the union. It was as simple as that. I could argue with the pit manager, and once the argument was finished, it was finished. But if you go to the college and say a word out of turn, you’re sacked. Robert The employment situation in Fife has changed dramatically. Joki You’ve got companies coming in here like Amazon and Exxon telling you what your rights are in your ain country. That cannae be right. They tell you that you’re not getting represented by a trade union. You’ll be working these hours, signing short-term contracts. Robert These are two of the biggest employers in Fife right now. Sounds like a return to the old days, when the private coal companies in Fife were among the most exploitative in the UK. ExxonMobil has been replacing union workers with non-union low-paid contract labour in the States. But are people not desperate for work? Joki We used the arguments years ago: is it worth having jobs at any price? It’s not. It’s no worth the zero-hour contracts and people turning up for work, getting a couple hours and then told they’re not needed anymore. Megs When I was first sent by the dole for the interview for Amazon, I thought I was going to work in a lab somewhere that needed all the security in the world. You needed to get tested for drugs and alcohol, and they come with you to the toilet. It was painful, a joke. Then it was one point for this, or five points if you’re late, and points add up against you, and if you don’t turn up, well . . . I wasn’t there long enough to get points! Joki Young Dean when he started in Amazon, that laddie worked every shift they asked him, done everything, and two or three days before Christmas they says, ‘Right, you’re paid off.’ They’re employed through an agency. There’s only maybe 300 core, and at Christmas there’s 1,000, all short-term agency workers. Nae holidays, nae pension, nae nothing – and zero hours. After that boy got paid off he just went, ‘What’s the point of this? I’ve done everything they’ve asked me, and it’s still not good enough, so I’ll just not bother. I’ll go down and get a bottle of Buckfast and sit in the back garden.’ That’s what happened when big industry left Fife. Robert We’ve had strong support for the film from all sides in the current debate about Scotland’s future. It seems to unite rather than divide. My sense of [what will happen with the referendum on independence] is that the traditional Labour vote is going to decide the outcome. The Nationalists, the Tories and the Liberals have all decided. The Greens and the Scottish Socialist Party have joined the ‘yes’ campaign. How does it feel from here, in the Fife villages that John Maclean once described as ‘the Bolshevik fortresses on the plains of capitalism’? Joki I’ve met loads of really good guys from places like Liverpool and London and Kent and all over: solid working class boys like myself. At the same time, I keep looking at England, and I can see the Tories getting voted in, and we’re up here with nothing. The biggest argument the noo – and the SNP’s losing it all the time, and so is the Labour Party – people in Scotland cannae differentiate between independence and nationalism. They cannae understand that we could have an independent country that has a socialist government. They think if they vote for independence Alex Salmond’s going to be in there forever. Robert It worries a lot of folk who are internationalist but would also like to see real power devolved down to as local a level as possible. Joki Right now the vote will be ‘no’, in my opinion, but there’s a year to go, and I can see it steadily creeping towards a ‘yes’. To be honest, I just dinnae want the Tories to rule me again. They’ve drove us into the gutter for too long, and it’s a fact the Tories will never ever get into power in Scotland. Yes, I’ve more in common with somebody from Bethnal Green – it is a class thing, too – but I just feel personally if we got independence I can jump on a train, walk down the Royal Mile with my placard, and stand outside the Scottish Parliament. I ken that sounds naive, but it’s direct. Robert Our film commemorates a defeat. Yet people have been inspired and taken ownership of The Happy Lands, sharing their personal stories and their family’s relationship to the events portrayed – but it is still the story of a defeat. Joki I’d say it’s no’ about winning and losing. It’s about making it hard for them. It’s about no’ forgetting who you are. The film brings that all out. It’s like everybody got different ideas, but if the college where I work was to go on strike tomorrow, I’d be the first through the door, and if I’m out for another year, then so be it – I’ve that commitment. I think if your granda’s went through that seven months in 1926 with nothing to give you a wee bit better pay or better conditions, it’s not up to us to give that away. It’s up to us to keep that for our bairns. I had an argument with a boy at my work. We had a day of action because of the pension, and the boy says, ‘It doesn’t affect me. I’m retiring next year anyway.’ I said, ‘Neighbour, what if your granddaughter gets a job in the public service, and they say to her, “you haven’t got a pension”? She’ll say, “That’s because my granda didn’t fight for it.”’ It’s not you you’re fighting for; it’s the folk that’s coming at the back of you. Megs Everyone that watches The Happy Lands, they’re fired up. It’s there, it’s in you and it’s not until you watch the likes of the film that kindles it and proves the point to you that it’s still there, still inside of you. Even the young ones watching it didn’t realise. It makes them realise the power they could have.